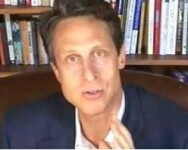 In the video Dr. Mark Hyman talks about exercising and supplements to boost your Glutathione. Glutathione is the “master antioxidant” most important for immune protection. It can be even replenish other antioxidants polluted with free radicals.